On September 29, 2012, the day before the Chinese Mid-Autumn Festival, many people went to Chinatown to do their shopping for the holiday. 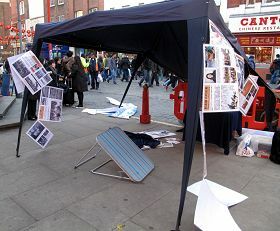 Falun Gong practitioners set up a booth to let people know about the persecution of Falun Gong in China. 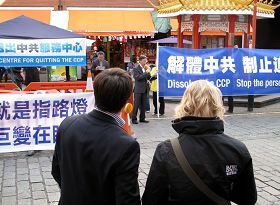 The volunteers of the Service Centre for Quitting the Chinese Communist Party (CCP) held a press conference. During the activity, several Chinese men violently attacked the tent set up by the Service Centre and then ran away. The police came and began an investigation. The practitioners continued their activity and won support from the crowd. The Service Centre set up a blue tent in front of the gazebo at the entrance of Chinatown. Around it there were Falun Dafa posters and banners that read “Service Centre for Quitting the CCP in England” “Dear Fellow Chinese, Have You Quit the CCP and Its Organizations?” and “Cheers for the 120 Million Who Quit the CCP and Its Affiliated Organizations.” Many volunteers and Falun Dafa practitioners distributed fliers to help more Chinese people understand the truth of the persecution and quit the CCP and its organizations. Dr. Li, the person in charge of the Service Centre in England, talked about how the Chinese communist regime illegally removed Falun Gong practitioners’ organs while they were still alive and sold the organs for profit. This atrocity has received great attention within the international community. Dr. Li hopes the Chinese people will recognize the CCP’s vicious nature and quickly quit the CCP and its affiliated organizations. Ms. Liang, volunteer of the Service Centre, talked about how people from different walks of life quit the CCP. She hopes that more people can see the CCP’s evil nature, find their conscience, and quit the CCP and its affiliated organizations. Around 5:20 p.m., three or four Chinese men rushed into the tent set up by the Service Centre, and overturned a table that was full of fliers, pamphlets, and DVDs. They pulled down the tent, the posters, and the banners and threw them on the ground. These men quickly ran away. Dr. Li called the police and they arrived in less than ten minutes. They looked over the scene and talked to the witnesses. The police said that they would use the surveillance cameras nearby to identify the suspects. After the police finished the investigation, the practitioners put everything back. The incident drew the attention of more passersby to the tent. 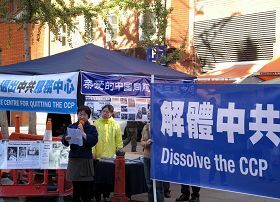 The practitioners took the opportunity and used this incident to clarify the facts about the persecution of Falun Gong. 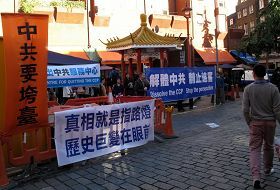 The Falun Gong practitioners demonstrated the exercises near a stone lion in Chinatown. Many people stopped to watch them and sign the petition to support Falun Gong. 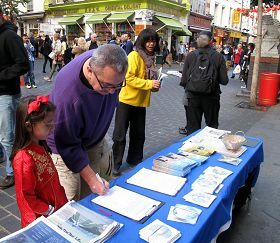 A British man brought his daughter to sign the petition to protest the persecution of Falun Gong. The man’s wife was Chinese and the daughter spoke Chinese. The man told the practitioners his experience of learning about Falun Gong for the first time. He went to Xi’an with his wife when they travelled to China. They met a very happy taxi driver. They rarely saw that kind of happiness and asked him why he was so happy. The driver told them he practised Falun Dafa. A Chinese man stood in front of the display for a long time. He carefully went through every picture. He said that he was a Buddhist. He said he felt really sad seeing the pictures of practitioners being tortured and that he knew that the practitioners were very kind. A practitioner asked him whether he knew about the trend of quitting the CCP and its affiliated organizations. He did but he had not quit. He was once a member of the Communist Young Pioneers. The practitioner suggested that he quit with the name Foyuan and he agreed.